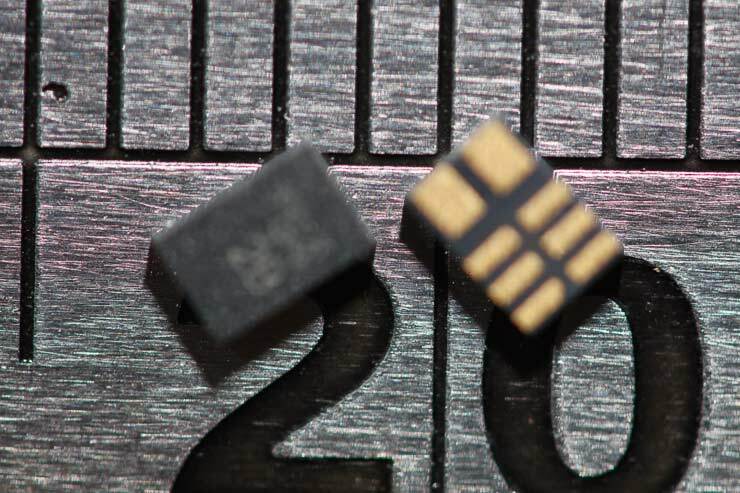 At Northlight, Keith sometimes produces photographs of very small electronic components for our clients. 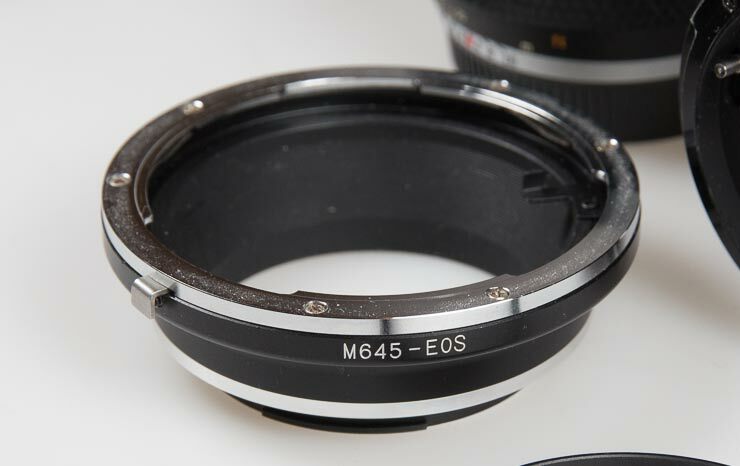 For this we have the Canon MP-E65mm macro lens, which goes up to x5 magnification. 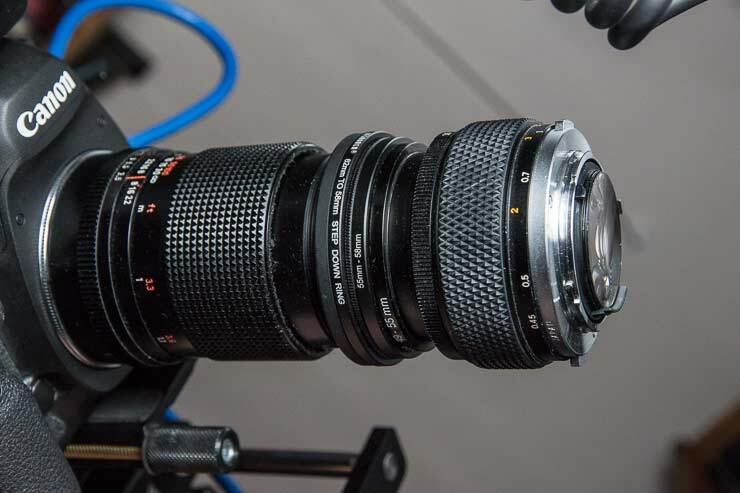 A great lens, but perhaps a bit pricy if you’re just experimenting. Keith has taken some of our old manual lenses and with a bit of cardboard and some adapter rings made a macro that works at x4 magnification and is effectively telecentric. Other variants are shown with x2.2 and x1.4 magnification. I’ve the MP-E65 lens that offers macro from 1:1 to 5:1 magnification, so what’s different about the (fixed) 4:1 macro I’m producing here?I don’t really want to go into the optical design in great detail (much like formulae or any maths, it’s a great way to lose readers right at the start of an article) and was looking for an easy way to explain what it means in this context. Imagine you are looking over a gate and photographing a field of cows. The near ones look larger and those far away look smaller. This is so obvious that we don’t even think of it. Now imagine that directly behind you the moon is rising. On the moon we have a very powerful telescope (camera lens). It’s so powerful that we can see the field of cows (and you looking over the gate). With the quarter of a million miles between the telescope and cows, if we take a photo, then the cows at the far end of the field look just the same size as the ones coming up to you at the gate. I can now measure the size of cows in the photo from the moon and use it to see if any are bigger or smaller, something I can’t immediately do with a photo from the gate. If I want to measure items, without knowing their distance in front of the lens, I need a lens which is a long way back (maybe not the Moon, but you get the idea). It turns out that there is such a design of lens, and the term Telecentric is often used to describe them. They are widely used in machine vision systems and usually cost a lot of money. My apologies to optics specialists, but for anyone wanting more info., have a look at Edmund Optics, where they have some good articles and sell the lenses. In one of my first macro experiments, I simply reversed a 28mm manual focus lens and glued it to the front of some extension tubes. I remember bookmarking a DPReview thread some years ago which discussed the combination of two lenses, with an aperture stop in between them. The true telecentric lens has a zero field of view – in practice this means that its field of view is limited to the diameter of the lens front element. In the example above, the (now) front element is quite small – I remembered my Olympus Zuiko 50/1.2 lens, where the rear element is ~35mm diameter. For the second lens I’m using a Mamiya 210mm f/4 medium format lens. It’s the one I tried with a shift adapter some time ago. 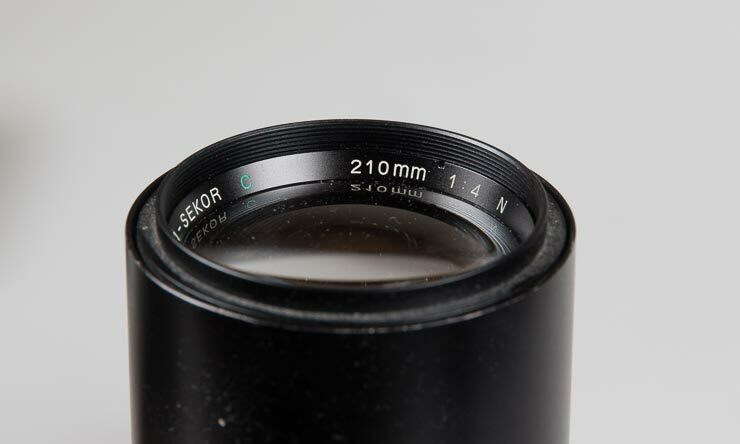 The 210mm lens has a 58mm filter thread, whilst the 50mm has a 49mm thread. 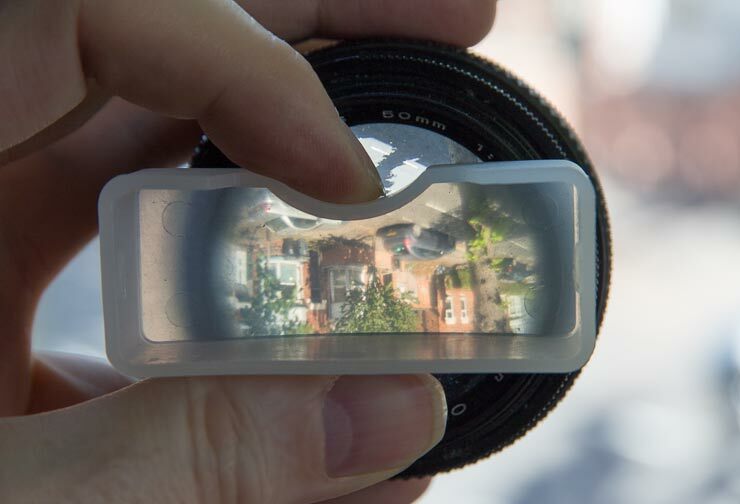 In between the lenses needs to go a stop – mine’s a bit of card with a cleanly cut 15mm hole in it. 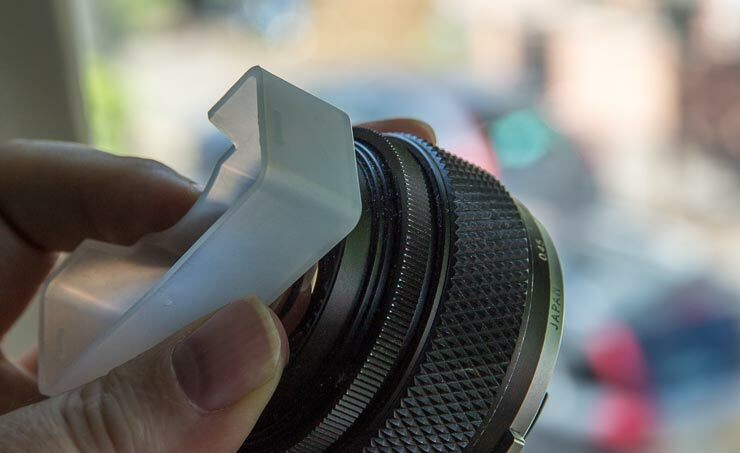 The stop works its ‘magic’ if its placed at the focus point of the 50mm lens when used backwards. Some frosted plastic (a flash diffuser) will make a viewing screen for the view out of my window. 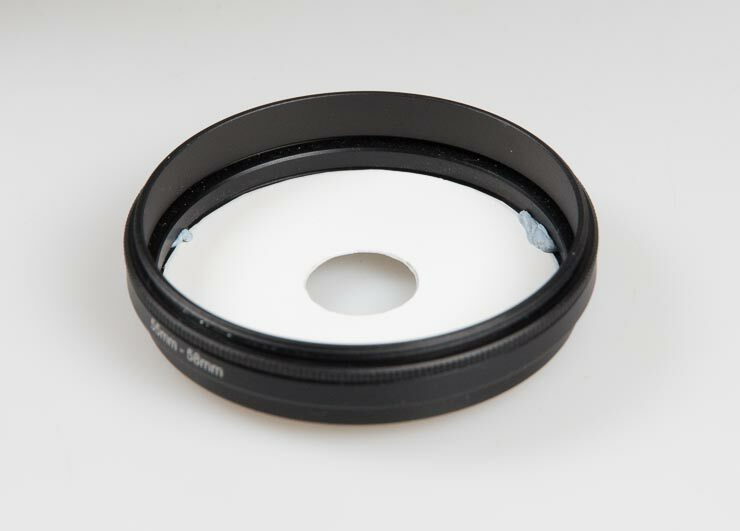 Holding it up, shows that the focal plane is a fraction of a millimetre in front of the filter ring. The longer lens needs to go as close to the front one as possible. A 49mm to 58mm step up ring and a 58 to 58mm reversing ring would be ideal. Looking in the junk box, I found a 49-55mm ring, and a 55mm to 58mm step up ring. The 58mm reversing ring cost a few pounds from Amazon. The cardboard stop is marked out with a compass and the hole cut (slowly) with a scalpel, to get a clean hole. 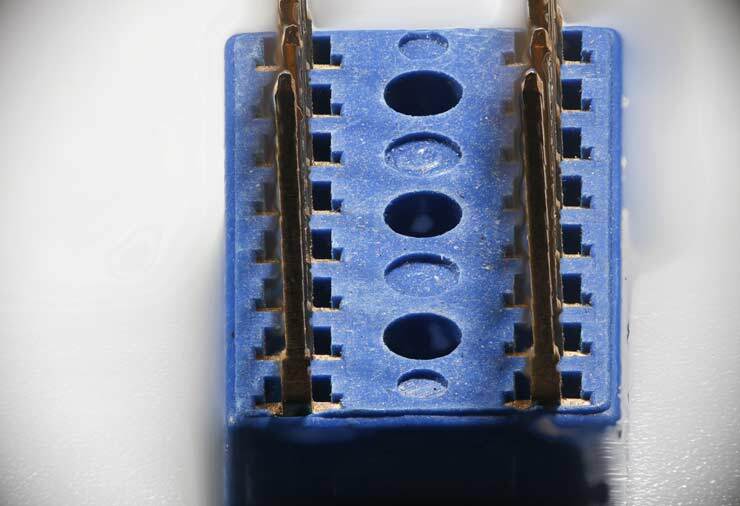 The blu-tak holds the stop in place and allows for centring, and easy swapping of stops. Don’t over tighten the rings when putting them together. 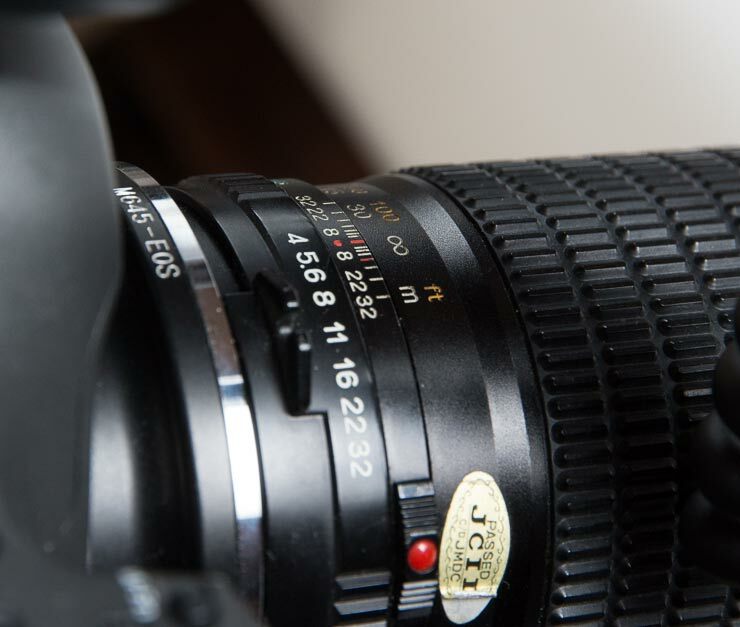 The size of the stop is calculated from the focal lengths of the two lenses and the aperture you want. This is quite a general guide to making the aperture stop – fortunately since it’s just cardboard, you can make several and see what works best. 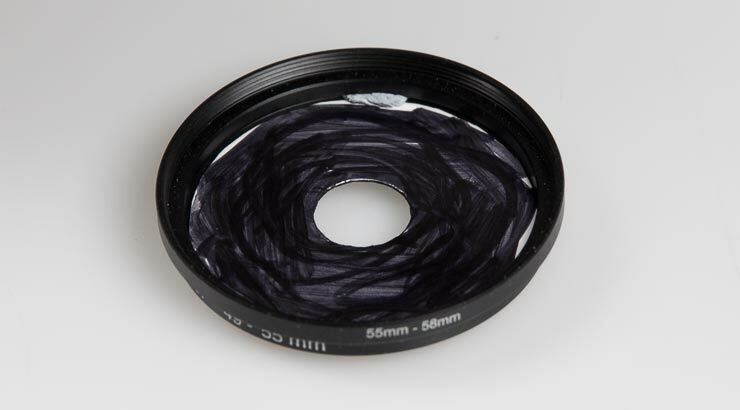 The ideal way would be to use the aperture diaphragm mechanism from an old lens, but I didn’t have any around. The hole diameter is given by the front focal length divided by our desired aperture, multiplied by our calculated value for BF. So for f/16 this is 50/16 * 5.2 = ~16.2mm. We’re talking about holes cut in cardboard, so a nice clean central circular hole is better than a precisely accurate one. I’d suggest experimenting with the lenses aperture and focus settings – you’ll find they have much less effect than you might have thought. 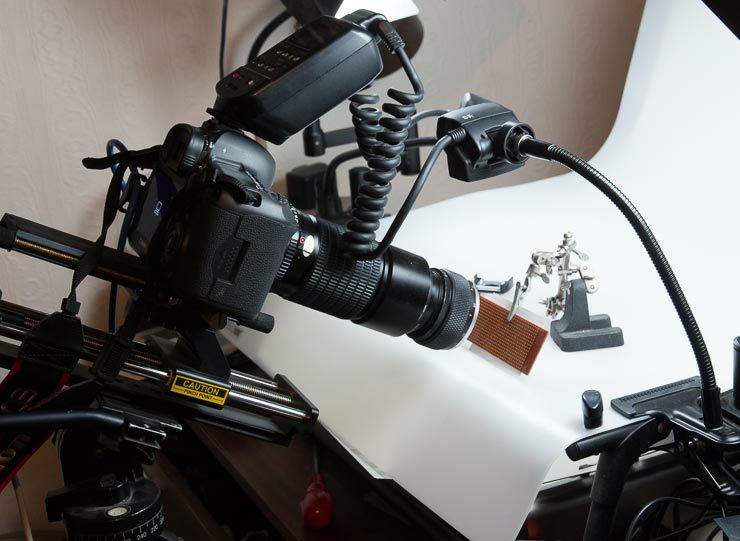 Here are the parts used – the important thing is getting the stop at the right place – other lenses would work. 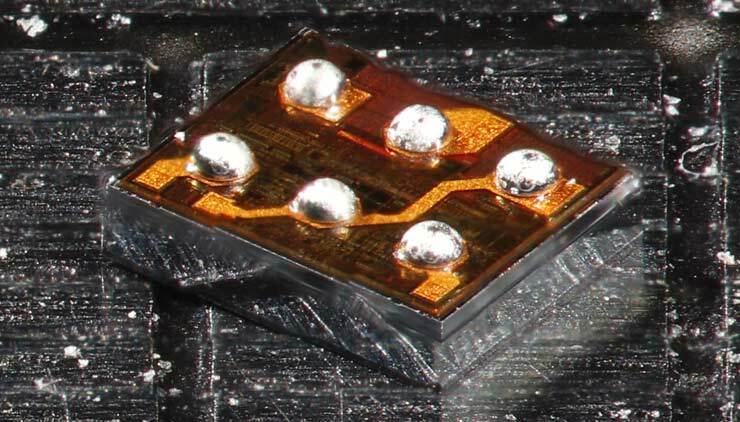 For a quick check of how the lens performs, I’m taking a photo of some Veroboard – a pre-perforated ‘breadboard’ used for making electronic circuitry (one of my previous careers was in electronics design). This in turn is mounted on a heavy studio stand. The working distance for the lens with my initial settings. I’ve put some thin card behind the board – the lens has quite a high magnification and a razor thin depth of field. 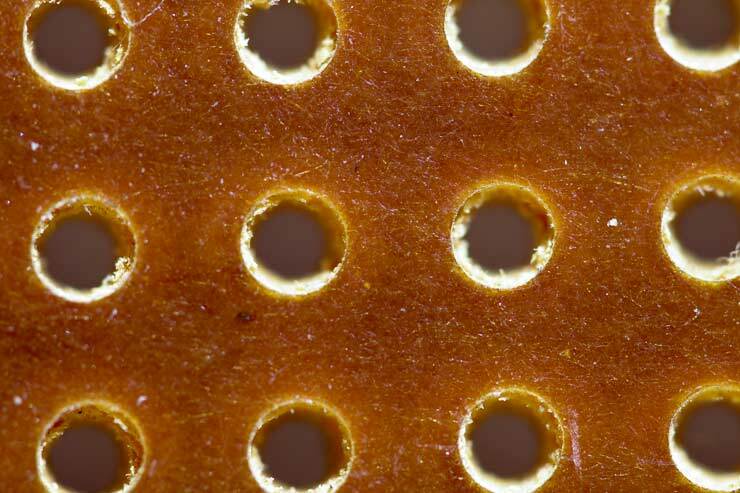 A shot of the holes shows the same view down each hole and the minuscule depth of field (DOF). 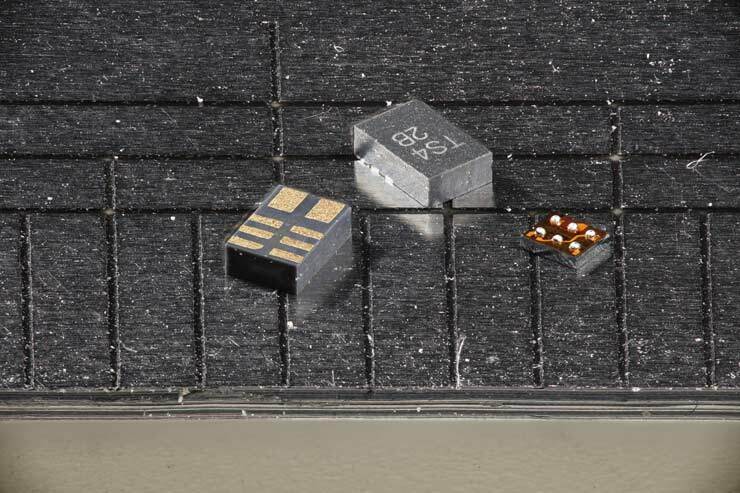 This view looking down on two small electronic components, gives a direct feel for the scale (ruler divisions are 1mm) and the shallow DOF. The red is just a bit closer than the focal plane and the weaker green just beyond. Now you’ve seen this, look for the weaker signs of it in the photo above as well (the change in colour of the gold). Fortunately, the colour fringing controls in ACR deal with this quite well. x4 magnification is a bit much for some applications, so I decided to change the rear lens for a shorter focal length. 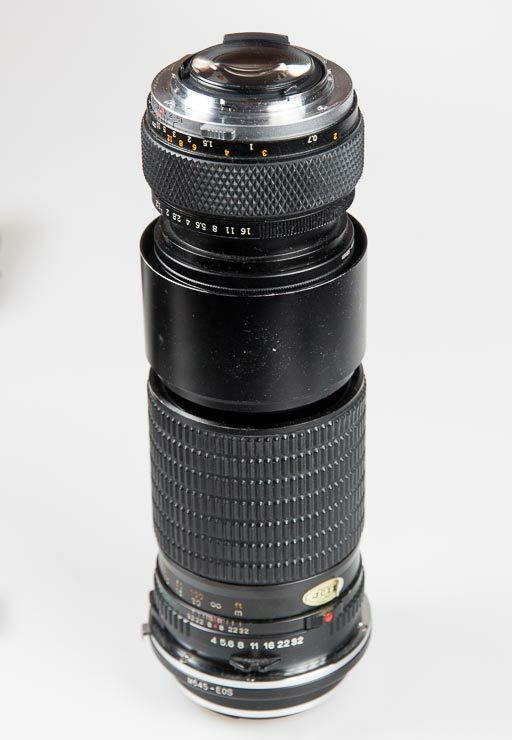 First up was the Canon TS-E90mm tilt shift lens. 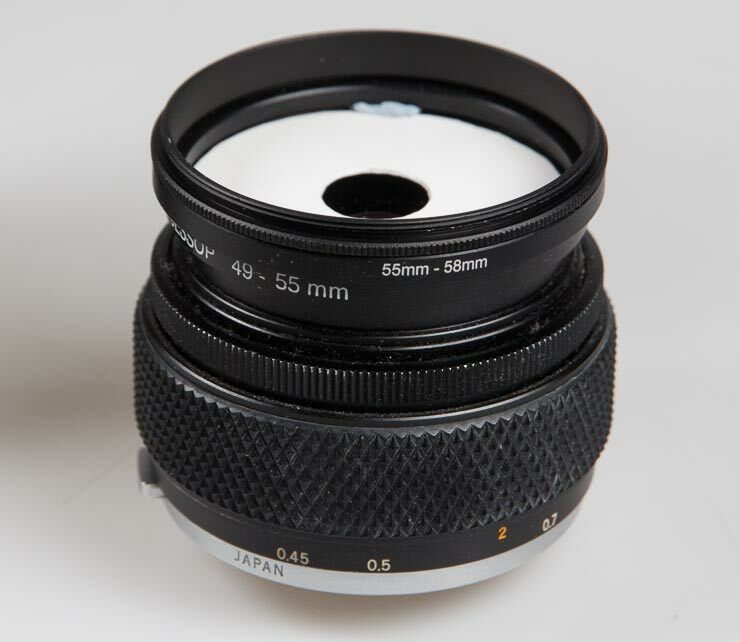 Its 58mm filter size made it easy to fit. However, the front element is set back some way, which moves it back too far from the front lens and gives quite pronounced vignetting. Next up was a Mamiya 80mm f/2.8 lens, using the same M645->EF adapter as the Mamiya 210mm. 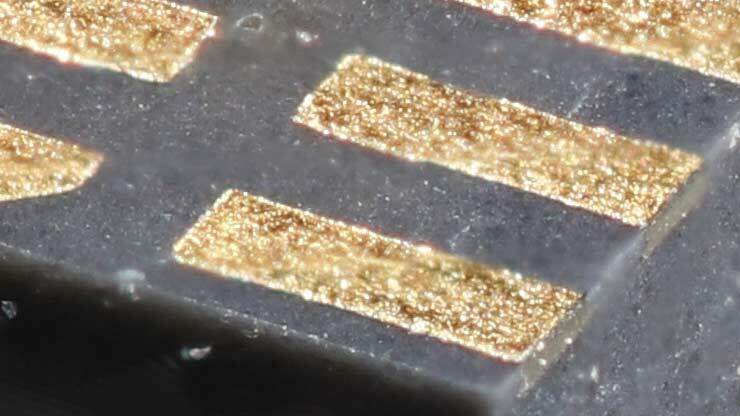 This stacked image of an integrated circuit wire-wrap socket shows how the projection of a rectangular shape that doesn’t get smaller as you move backwards, looks keystone shaped. I used Helicon Remote, on my Mac, driving the StackShot unit to take lots of images at different distances. The vignetting is quite obvious still, and in this quick stack of images, there are far too many artefacts and errors to be useful – most of that could be addressed with more care in the photography (more images) and care with the stitching parameters (in Helicon Focus). It’s M42 screw mount, so needs a basic adapter for Canon EF mount. Were I to use it more often I could reduce that, but I don’t have that many adapter rings. 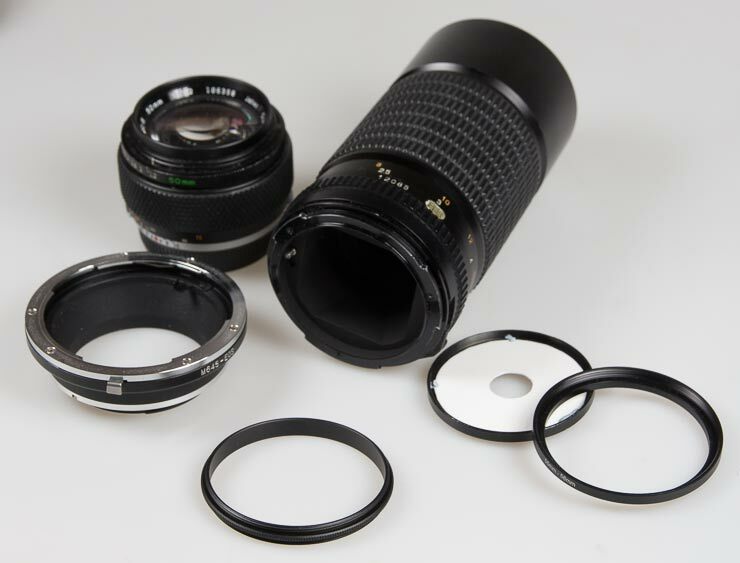 I would also look at dismantling a broken lens to get an adjustable aperture ring. 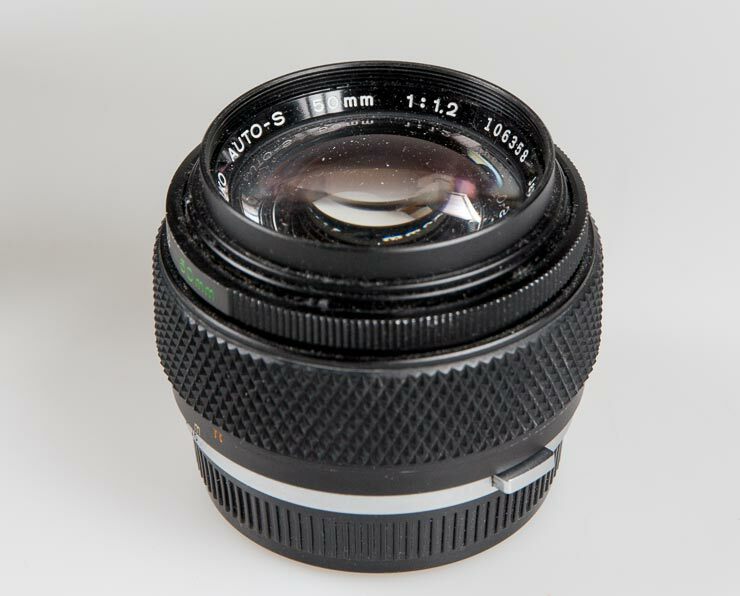 I’d also look at making a lens hood for the Zuiko. 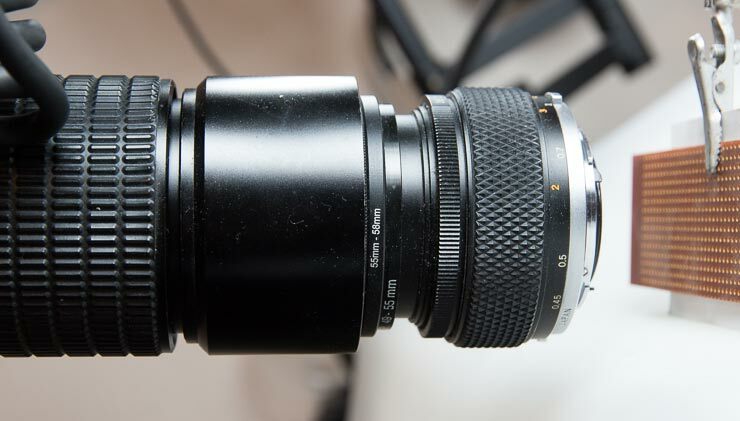 Since it’s a telecentric lens, a simple hole, the size of the front element cut in a lens cap would do. The image is a stitch of 46 stacked images. Even at this level of stepping, I could do better, since there is clear evidence of steps if you zoom to 100%. Note how bands of sharpness run across the view. At around 120 steps I suspect it would look even better (but do look back to the picture before to see just how much detail you get from 50MP. 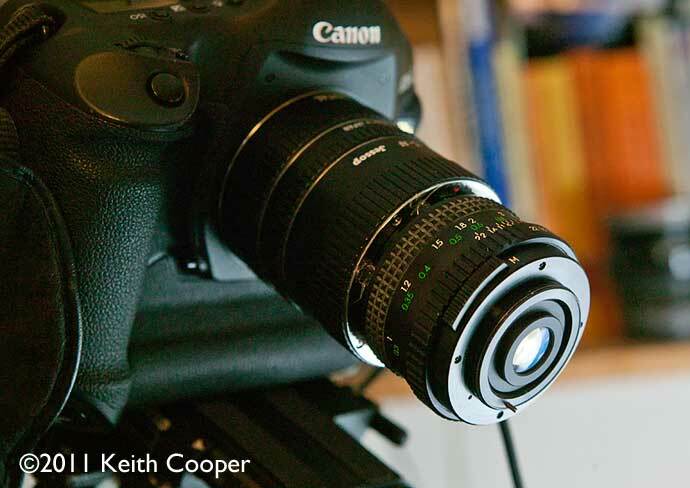 If 120 steps sounds a lot, it is, but Helicon Focus handles it just fine – even using RAW files from the 5Ds. 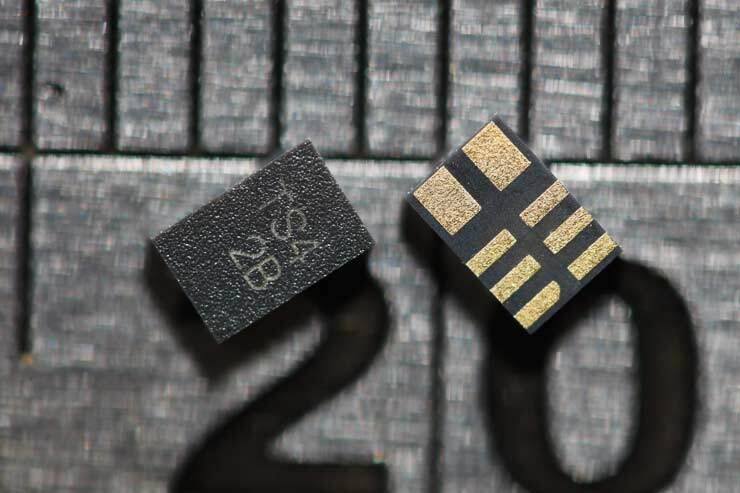 The smaller chip also shows a few wobbles – correctable by taking more photos and care with the stitching parameters. Apart from just being fun to try? 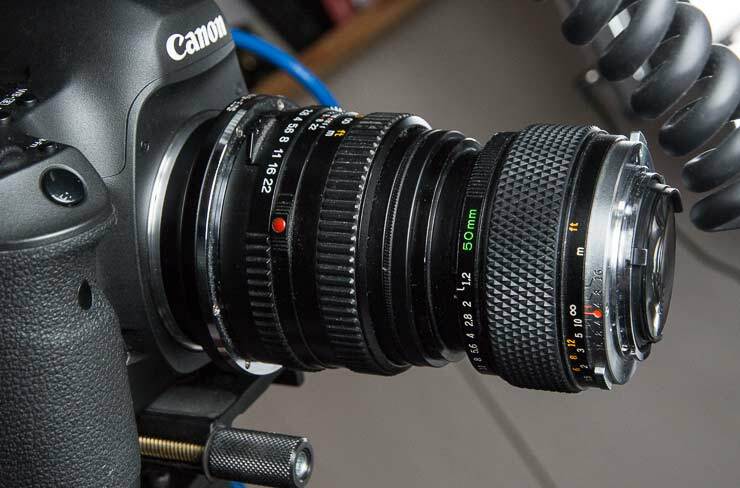 I use the StackShot and Canon MP-E65 lens for my commercial work (and a few other setups, such as the TS-E90mm with extension tubes). Since I’m just stepping the lens forwards and backwards, the software takes care of any scaling issues (you turn off many of the adjustments when using the telecentric lens). Edmund Optics telecentric lens info. Buying anything via our links helps me run this site, and is much appreciated. 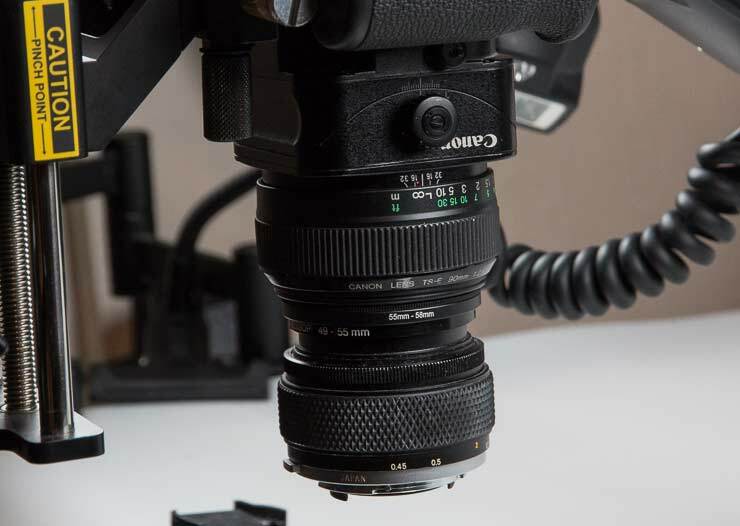 There are also adapter rings that fit the filter ring of your lens and allow it to fit right into a Canon extension tube. Make sure you get the correct filter size. 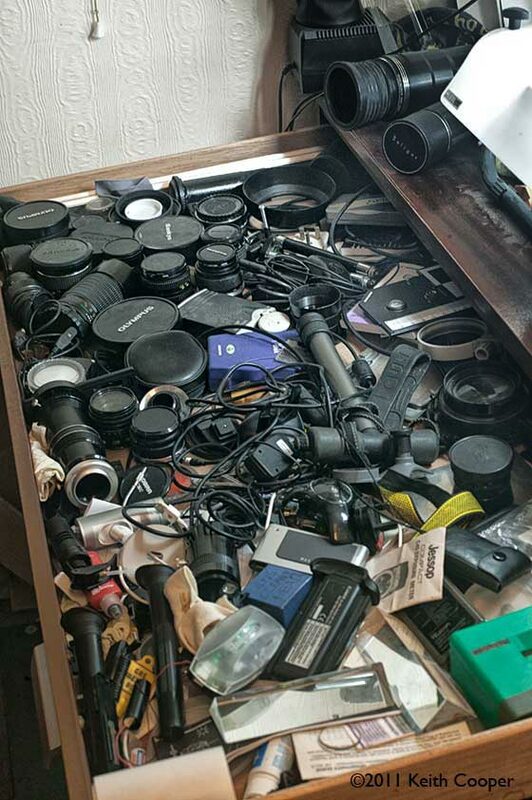 Very few of the lenses and items in the drawer below cost me more than a pound or two. 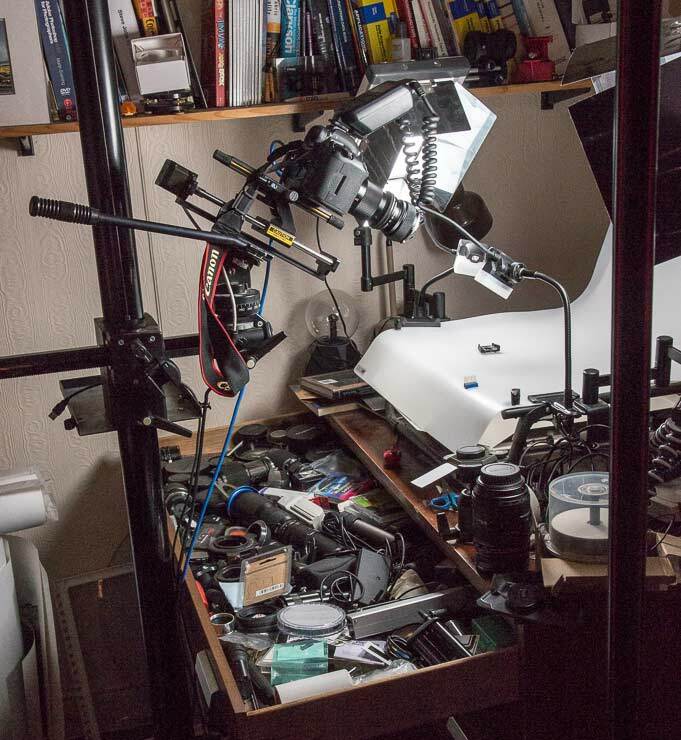 Next time you see old camera junk going to waste – save it (not necessarily a popular view in our house).